It says something about the depth of the Ottawa Senators system that a young player who could potentially make the big club this season – Mike Hoffman, the leading scorer on the team's American Hockey League affiliate in Binghamton – could not even crack the list of the team's top 10 prospects. Over the past five years, the Ottawa has stockpiled an impressive number of young players, some of whom will be ready to challenge for a spot with the Senators as soon as this season. The 2011 NHL Draft allowed the Senators to draft three players in the first round, Mika Zibanejad at No. 6, Stefan Noesen at No. 21 and Matt Puempel at No. 24, not to mention second-round pick Shane Prince. "We drafted a lot of skill last year," Senators director of player personnel Pierre Dorion told NHL.com. "What we've done in [the 2011] draft and the three previous drafts is we really improved the depth of our prospects. When [general manager] Bryan [Murray] and [assistant GM] Tim [Murray] took over we had three players returning in Binghamton and few players in junior we were going to sign, so the cupboard was really bare." That is far from being the case today, with a number of bright young prospects that puts the Senators among the most stacked teams in the NHL when it comes to the volume of promising players in the system. "I think at every position we have what I would call blue-chip prospects," Dorion said. "Some are playing [with the Senators] right now; some will be playing down the road." 1. 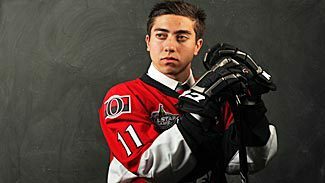 Mika Zibanejad, C: The No. 6 pick in the 2011 NHL Draft was given a nine-game audition with the Senators last season before being returned to Djurgardens of the Swedish Elite League, but he will be given every opportunity to make the club out of training camp this fall. While the Senators always knew the 6-foot-1, 200-pound forward would blossom, it became clear at the 2012 World Junior Championships. Zibanejad had a relatively modest showing -- three goals and an assist in five games -- heading into the gold-medal final against Russia, but the morning of the big game he predicted to teammate Jeremy Boyce Rotevall that he would win the game and the gold for Sweden. When the final went into overtime in a scoreless tie, Zibanejad reiterated his prediction to Rotevall in the intermission, and then came through with a breakaway goal at 10:09 to give Sweden its first gold medal at the tournament since 1981. "You have to decide if you want to win this," Zibanejad told reporters after the game. "In the morning, it was a joke, but obviously it's not a joke anymore." That is exactly the type of attitude that has Dorion and the Senators so excited. "He's a great skating power forward with an ability to score," Dorion said. "You like someone to step up in big moments, so when he scores the goal to give his country its first gold medal in 31 years, it tells you something about his character." 2. Jakob Silfverberg, RW: The 6-foot-1, 187-pound forward was called upon to help the Senators in Game 6 of their first round Stanley Cup Playoff series against the New York Rangers in the spring, and in his two games Silfverberg showed he may be ready for the jump to the NHL. 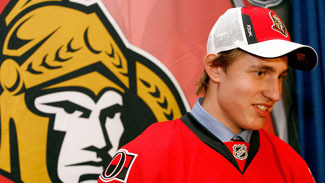 "He's got courage, he's got puck skills, and he's got great hockey sense," Bryan Murray told NHL.com. At 21, Silfverberg was named captain of his Swedish Elite League team Brynas IF and finished second in the league scoring race with 54 points in 49 games. In a vote by the players, Silfverberg also won the 2011-12 Guldhjalmen, or Golden Helmet Award, given to the league MVP. So his resume is already pretty stacked, and he will look to continue building it in Ottawa this season. "He's an all-around great talent; great instincts, great hands, great shot," Dorion said. "He's someone we expect to step up and help us. He approaches the game like a veteran would. He's got it figured out." 3. Robin Lehner, G: At just 21, Lehner has already won a Calder Cup championship in the American Hockey League with Binghamton – being named MVP of the 2011 playoffs in the process – and he's positioned himself as a potentially dominant goaltender in the future. Just how far in the future will depend on how long the Senators decide to go with Craig Anderson in goal, seeing as he has three years left on his contract, and also on how Ben Bishop fares in Ottawa. But the 6-foot-3, 220-pound Lehner has all the tools to one day take over in the Ottawa net. "He's going to be a very good No. 1 goalie in this League," Dorion said. "He's a tremendous talent. He's big, he moves well, he competes and he's able to win the big games – which is probably the best quality a goalie can have." Lehner will be competing with Bishop for the backup job in Ottawa this season. 4. Cody Ceci, D: The Senators were thrilled when this Ottawa native who plays his junior hockey with the Ottawa 67s of the OHL was available to be selected by his hometown team at No. 15 at the 2012 NHL Draft in Pittsburgh. Already NHL-sized at 6-foot-2, 205 pounds, Ceci is known for his strong skating and his ability to move the puck, notching 60 points in 64 games last season as an 18-year-old. With Erik Karlsson and Jared Cowen, Ceci is being looked upon as the third member of what the Senators hope will be a dominant "Big Three" on defense for years to come. "I think he'll be a big, strong body who can move the puck and play on the power play," Dorion said. At the draft, Murray suggested that Ceci will be given an opportunity to make the club in training camp, but he is all but assured of going back to junior hockey. For a local kid, just the thought of attending training camp with the hometown team is exciting. "It worked out for me," Ceci said at the draft. "I'm lucky enough to go back home and tryout for my hometown team. I'll try to make the most of it." 5. Mark Stone, RW: There aren't too many clubs who are blessed with having a sixth-round pick this high on their organizational depth chart, but Stone has made tremendous strides since he was taken at No. 178 overall in 2010. Stone scored seven goals in six games for Team Canada at the 2012 WJC, putting him on the fast track towards the NHL. "You look at what he did at the world juniors, that's pretty special," Dorion said. "And he did that all season long." 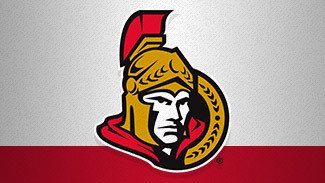 The 6-foot-2, 188-pound forward had 106 points in 71 games with the Brandon Wheat Kings of the WHL last season before being inserted into the Senators lineup for Game 5 of their series against the Rangers, picking up an assist in his NHL debut. his power to make that happen. "Mark has taken it upon himself to get better," Dorion said. "He's been in Ottawa a lot to work on his skating – which still needs improvement – and his strength. "But what he has in terms of hockey sense, his shot, his ability to make plays and his offensive instincts are things you can't teach." 6. Stefan Noesen, RW: Dorion describes the 6-foot, 187-pound forward with the Plymouth Whalers of the Ontario Hockey League as "the most pleasant surprise of our draft last year." Selected at No. 21 in 2011, the native of Plano, Texas, notched 77 points in 68 games, drawing rave reviews from around the league for his work ethic and drive. "He's gone from being a boy to being a man," Dorion said. "He's improved his strength, he's improved his skating, he scores dirty goals – he knows how to play the game. He wants to win, and anything he can do to win, he'll do it." 7. Matt Puempel, LW: With three junior seasons marred by injuries, the 6-foot, 190-pound forward is still an intriguing prospect who can score goals in bunches. Puempel was traded from the Peterborough Petes of the OHL to the Kitchener Rangers over the summer after scoring 84 goals in just 144 games over the past three seasons with the Petes, and Dorion feels he should have a chance to flourish with Kitchener. "He's a natural goal scorer who had a tough year last year," Dorion said. "He has great hands and great offensive instincts; he just needs to be more consistent." 8. Mark Borowiecki, D: This 6-foot-1, 185-pound Clarkson University alum is the prototypical shutdown defenseman – he's been facing the opposition's top forwards since his AHL rookie season in Binghamton in 2010-11. A fifth-round draft pick in 2008, he is expected to be competing with Patrick Wiercioch to earn a spot on the Senators out of training camp as a seventh defenseman. "He was probably our most consistent defenseman in Binghamton," Dorion said. "He might actually be one of the strongest guys we have in the organization. He's just a character defenseman with a physical edge." 9. Patrick Wiercioch, D: As opposed to Borowiecki, Wiercioch is more of an offensive-minded defenseman who can move the puck with good size at 6-foot-4, 192 pounds. The former University of Denver player had four goals and 16 assists in 57 games with Binghamton in 2011-12, his second season in the AHL. "When you're 6-foot-4 and you can shoot the puck and move the puck and you can contribute offensively, that makes you a pretty good prospect on defense," Dorion said. 10. Shane Prince, C: A teammates of Ceci's with the Ottawa 67s, Prince has put up back-to-back impressive offensive seasons in the OHL. The 5-foot-10, 181-pound center from Rochester, N.Y., had 25 goals and 63 assists in 59 games his rookie season, and he followed that up last season with 43 goals and 47 assists in 57 games. "He's a highly-skilled forward," Dorion said. "He's shifty, he has quickness and he can shoot the puck. I call him a double threat offensively, because he can make plays and he can score."